The most basic functions of a phone are useful tools for learning language. 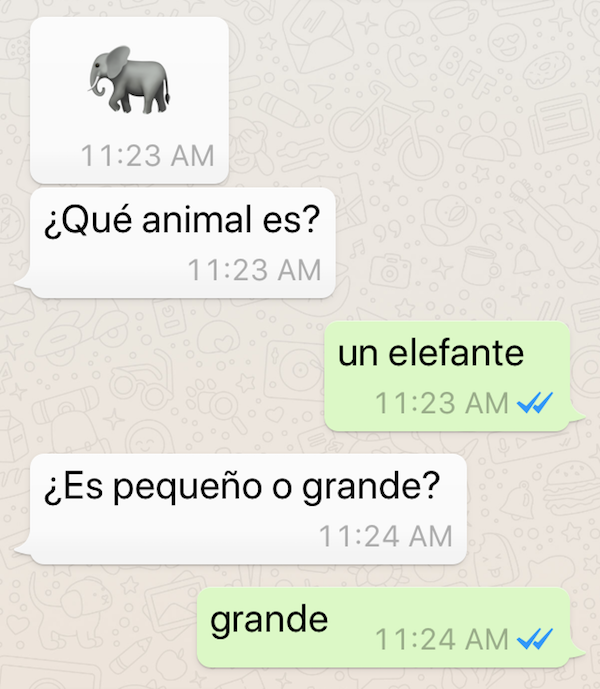 Try these 5 creative, interactive ways to learn Spanish on your phone or to engage kids that are learning the language. Of course, these ideas work with tablets too. 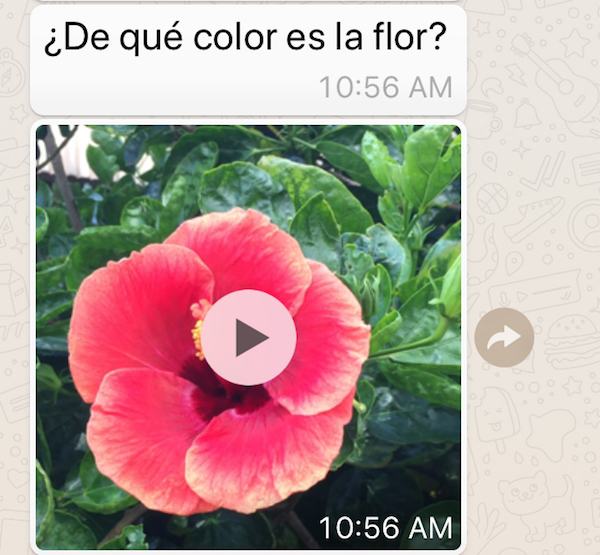 These interactive ways to learn Spanish on your phone take advantage of built-in features. In other words, you do not need language learning apps. Use the suggestions below as a way to engage children (young kids need to be with an adult with a phone), teenagers, or practice with a friend. They are also a fun way for kids to interact with family far away. 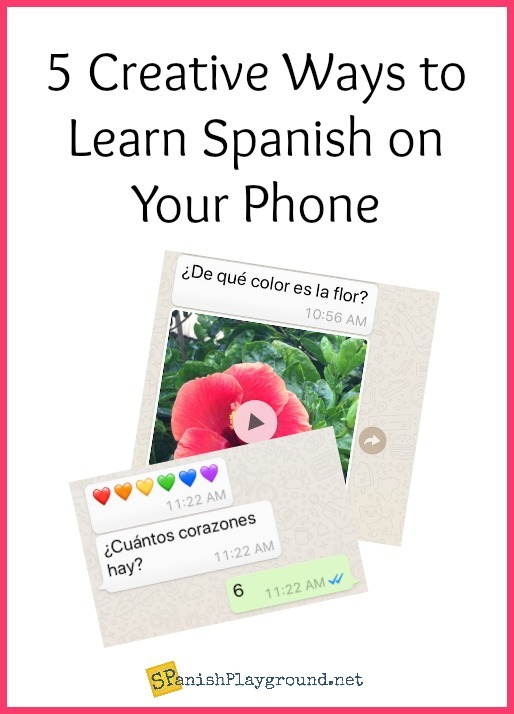 Of course, you can also use these ideas to learn Spanish on your phone in a classroom, or with someone in the same car, or house. The goal of these interactions is for learners to hear or read and respond. I use complete sentences as I speak and write, but I am only interested in the content of the answers. It is fine if a student answers with a single word. You control the communication. There is no social media and no interaction with strangers. The communication is relevant and personal. The vocabulary reflects your surroundings and your life. It’s a wonderful way to share everyday life. The interactions happen in bite-sized pieces. You can make the language comprehensible for any level of language learner. A combination of video, audio, images and text combine to support language learning. Auto-complete is an excellent tool for beginning readers. Show kids how options appear as they type. They need to hear the initial letter sound, of course, but then they are given options. It’s great practice for early readers and very empowering. These ideas are quick, easy and take no planning. Of course, there are lots of great apps for learning Spanish. Check out 5 Apps for Reading in Spanish and these Fun Game Apps Kids Should Play in Spanish. Emojis are designed to be easily identifiable, so they are perfect for supporting language. Try sending an emoji and a question. There is a large selection of images and almost all are related to everyday objects and common activities. You can see several examples of questions in the screen shots below, and you will think of many more as you look at the emojis that are available. Kids can answer these questions by typing or by recording a voice message. For younger kids, the voice message option is quick and fun. Keep in mind that emojis are larger if you send them separately. If you include your text in the same message, they are resize and are a little harder to see. Sentence building takes practice, and you can make a fun game of it by building sentences on a phone. The idea is to alternate messages adding words until you complete a sentence. I use text and build a sentence word by word, but you can also do it in voice messages. You can make this activity more concrete by sending a photo first, and then building a sentence about the photo. It’s also fun when the sentence is random. When I am traveling, I send these videos to my students. It is a great way for them to see Latin America and get more language exposure. It is also super easy for me. These very short videos combine a focused image with audio. They are easy to make because you hold your phone near your mouth, so the audio is clear. Just the video is fun and good listening practice, so you don’t have to ask a question. However, you can also add a question about the video. In the screen shot below, you can see the question. I have uploaded the video separately so you hear how simple the audio is. My students love these little videos. Of course, I ask them to send me videos in return. A photo is a fun way to connect with someone. Take a picture of whatever is in front of you, such as your desk, the kitchen table or the dog. Describe the photo in a short sentence. You can do it in a text or in a voice message. Then ask “¿Qué ves?” Kids respond by naming something they see in the photo. You can also ask a specific question about the picture, in text or voice, or they can ask you a question. You can use the voice message option as a way for kids to practice listening, reading and writing. Type a sentence using familiar vocabulary. Kids read the sentence and record it as a voice message they send to you. You can also send a voice message and kids can type what you say. 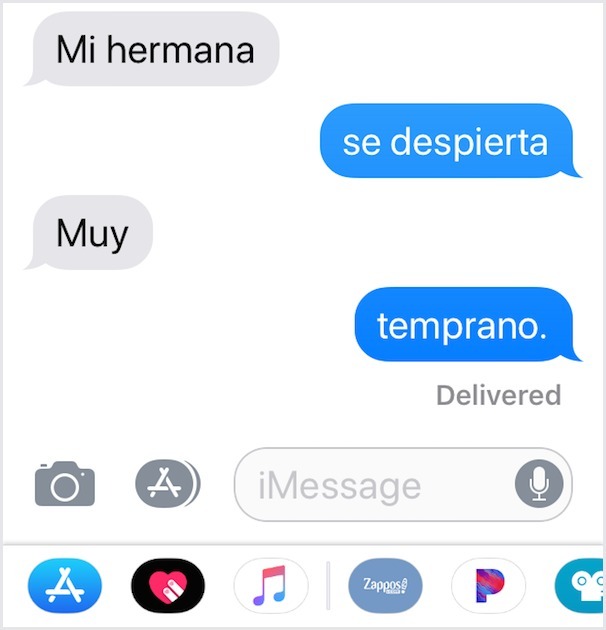 Either way, you are practicing connecting text to the sound of the language. Again, it is easy to combine these messages with a photo to make it more concrete. You can adapt these ideas to learn Spanish on your phone to any teaching situation. They are fun, easy and employ relevant language. Do you have a favorite way to learn language with your phone or device? Please share in the comments below! Qué ideas más divertidas y cheveres. Una pregunta, ¿usas alguna aplicación especial para mandar textos o la forma regular directamente de tu teléfono? 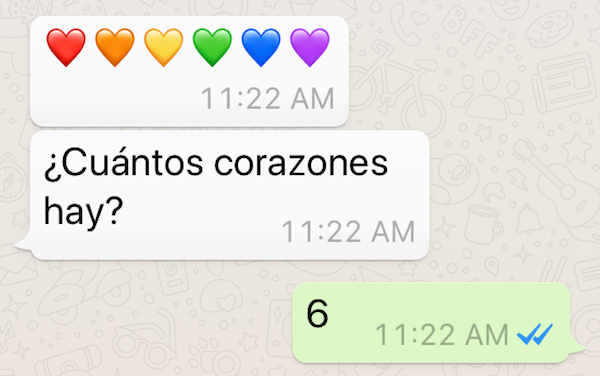 Lo hago o con imessage o What’s App. 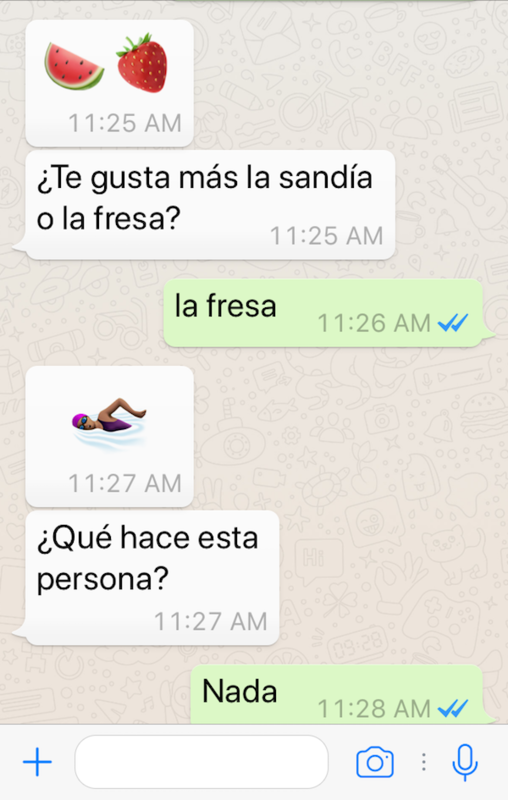 No importa la aplicación porque todas mandan emojis, fotos, video, y mensajes de voz. Saludos!